According to legend, Bern was named when its founder, Berchtold, was advised to go on a hunt and to name the town after the first beast that he caught. The bear has remained the symbol of the capital city ever since. One of the most charming cities in Europe, its Old Town centre was designated a UNESCO World Heritage Site for the preservation of its cobbled medieval street plan, with many fountains, towers and a massive astronomical clock. With its relaxed atmosphere, farmers' markets and friendly people, it is easy to forget that this is the Swiss capital, an important city of politicians and international meetings. 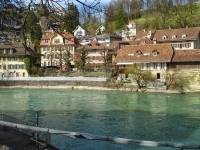 And with its interesting museums, theatres, long-standing monuments and landmarks, Bern is a popular base from which to explore the mountains and lakes of the nearby Bernese Oberland.